As a child who grew up middle class in Burmese society, my early childhood was full of happiness. But nothing in this world is stable. Before I reached kindergarten, my family faced a financial crisis, so my parents made a tough decision to migrate to Thailand illegally. This was in 1995. They left me at a relative’s house so I could continue my education. In those days my parents could support my educational fees, so my relatives let me stay with them. But this only lasted a few years. As far as I can remember, my parents supported me up until third grade. Because they worked illegally, my parents were arrested off and on, and while they were in jail they couldn’t support me. During those times my childhood was full of bitterness. My relatives complained a lot about my school fees and they didn’t want me to stay at their house until completing high school. I didn’t have anywhere to live. As a young girl facing these difficulties, I wanted to give up on my studies. I couldn’t pay attention to my education. I was concerned about money and wanted to work. I thought if I had money then I wouldn’t face these difficulties. But I was too young to work and I didn’t know how momentous education was in my life. In grade ten, about a year after one of my parents’ arrests, one family in my community who knew my situation took pity on me. They wanted me to continue my education and so they supported my school fees and allowed me to stay in their home. In 2007, I got information about my parents and established contact with them. They asked me to come and stay with them in the city Three Pagodas Pass along the Thai-Burma border. After taking my matriculation exam for junior college, I went to them. I taught children in the neighborhood while I lived there. I taught many subjects because I sympathized with them—they had a lot of difficulties accessing education like I and others did. I didn’t want the students to face these problems so I helped as much as I could. 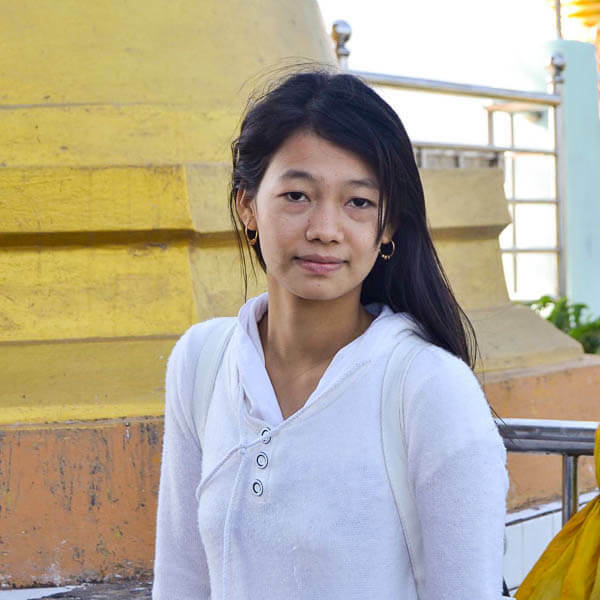 Naung’s view of the bigger picture has been something that’s made her stand out of the crowd. Furthermore, I value her honesty and openness as well as her reliability. Besides interacting with instructors she also shows a high degree of participation and interaction with her fellow students […] So far she’s never failed to impress and has quite often exceeded expectations when it comes to assignments or exams. While living there, I heard I passed my matriculation exam. I desired to continue my education in one of Burma’s universities but my parents couldn’t support the fees. So, I made the tough decision to continue my education at a junior college in Noh Poe Refugee Camp. At Noh Poe I was happy because I had the opportunity to continue my education, but also sad because I needed to leave my country and family to do it. I stayed in Noh Poe for nearly four years. While living there I became aware of my country’s situation. Because of civil wars children became orphans, fatherless and motherless. Children lost not only their parents but also their hopes of education. After learning my people’s situation and their need, I wanted to do something for my society. A Chinese proverb says, “If you are planning for a year, sow rice; if you are planning for a decade, plant trees; if you are planning for a lifetime, educate people.” I believe education is the most fundamental thing my people need for their future. Education gives skills and knowledge and guides them on how to shape their future. To educate my people about freedom, democracy, and history, I need to be qualified and skillful in those fields, which is why I have decided to study philosophy, politics and economics at Rangsit International College. There are very good opportunities for us to apply and rally our education in different ways than during the military epoch. By dint of many reasons our country has been plagued in the dark for decades. But the dawn is brightening. By clutching opportunities from this occasion and applying the knowledge we have, we should do the best for our country. I trust that the course I take will not be a waste for my community. I was born in a community where hundreds of high school students drop out and cannot attend university; where there are hundreds of child laborers, early marriages, struggles with the civil war, poverty, and so on. Everything I want to do with my life is through awareness. I want help unlucky ones open their doors to the outside world and see myself involved in humanitarian affairs as much as possible when I graduate. Written by Naung with editing assistance from Zomia’s volunteer editors. When I heard the news that Daw Aung San Suu Kyi was released from house arrest. I would rather choose not to go back. All those years weren’t smooth with me. But if it’s compulsory, I would choose the year in which my parents returned to Karen State and the reunion of my family began after 10 years. What was your worst class last semester? Why was it the worst? If I have the chance to accept a Zomia loan, I can graduate in time so that I can work to serve my interests of humanitarian affairs in my country.